Two friendly cats linking tails. A lovely ornament gift, sculpted by Paul Jenkins. 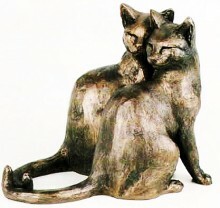 Made from cold-cast bronze. This cat ornament is just one of this great collection! Bottom is felted to protect surfaces. Engraved with the initials PJ.